Alexa Mickell graduated with a Bachelor of Fine Arts in Photography from Whitecliffe College of Art and Design in 2012. 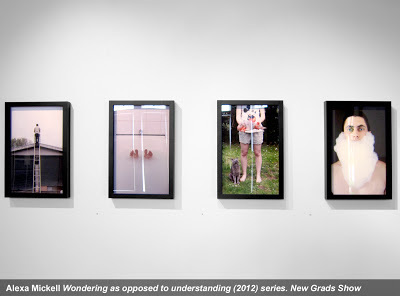 Her series, Wondering as Opposed to Understanding is currently being exhibited in New Grads Show, on at Corban Estate Arts Centre until 24th February. A work from this series was bought by the James Wallace Arts Trust from Alexa’s graduation exhibition. Alexa lives in West Auckland and this year she received a scholarship to continue her study at Whitecliffe to gain her Masters in Fine Arts.